Pomegranates are a so-called "super food" that has been cultivated since ancient times. Pomegranates are found in their raw form, in juice and in a hundreds of products from candy to breakfast bars. The health properties of pomegranates are studied for everything from cancer prevention to skin care. Pomegranates are native to northern India but are grown everywhere from China and the Middle East to Arizona and California. Pomegranates have a yellow, red or pink tough, leathery rind. Transparent sacs filled with tart, juicy pulp and seeds called arils are found on the inside. The arils can be eaten directly or extracted for their juice. Slowing and preventing oxidative stress caused by free radicals are among the roles of antioxidants. Antioxidants work to repair or prevent damage to your body's cells. Fruits, vegetables, nuts and whole grains contain variable amounts of antioxidants. The National Cancer Institute reports the extensive research between cancer and antioxidants as promising in laboratory and animal studies, but large-scale clinical trials in the 1990s have shown inconsistent results. The U.S. Department of Agriculture developed a database for the antioxidant capacity of fruits, vegetables, spices and nuts, which ranks food in terms of its oxygen radical absorbance capacity, or OTAC. One cup of pomegranate juice contains 5923 micromoles of Trolox Equivalent, TE, per 100 grams. TE is a measurement of antioxidant strength. Based on a typical serving size, pomegranate juice ranks fifth behind baking chocolate, elderberry, Red Delicious apples and Granny Smith apples. Pomegranate juice's antioxidant capacity is similar to prunes, dark chocolate and red wine. Pomegranates supply a number of vitamins, including several recognized for their antioxidant properties. One pomegranate supplies about 30 milligrams of vitamin C, a vitamin needed for healthy skin and also a potent antioxidant. The fruit also contains about 1.5 milligrams of vitamin E, another anitoxidant vitamin that supports immune function, communication between your cells, and helps keep the lining of your blood vessels smooth. Antioxidant properties of these vitamins also help reduce accumulation of free radicals in your body, naturally-occurring chemicals that can raise your risk of chronic problems such as heart disease and cancer. 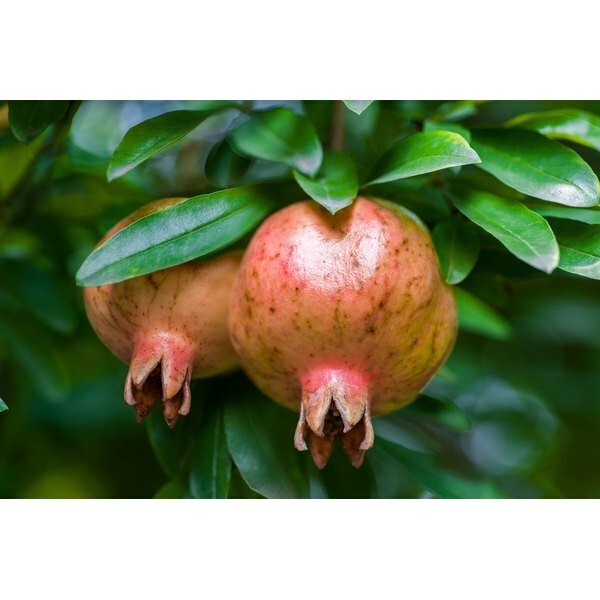 Published in 2009, a review by Vaqar Mustafa Adhami and colleagues at the University of Wisconsin-Madison explored pomegranate's relationship in the prevention of multiple cancers. Seed oil, juice, fermented juice and fruit extract were among the parts of the pomegranates tested. According to laboratory and clinical evidence, pomegranates are beneficial in preventing the development of breast, prostate, lung, colon and skin cancers. American Dietetic Association: What Is An Antioxidant? What Are the Health Benefits of Tangerine Seeds?